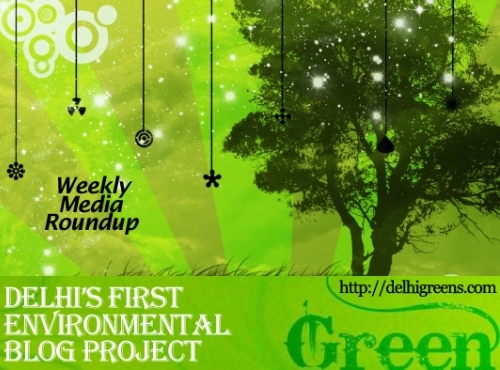 Weekly green news update from across different media networks for week 41 (between October 10 to 16) 2016. After Delhi celebrated Dussehra, doctors in the national Capital are treating increasing number of patients with respiratory ailments. In an order to recycle green and plastic waste, North Delhi Municipal Corporation (NDMC) has collaborated with a private partner who will generate energy and make useful products from garbage generated in parks and used plastics. This festive season has turned into a harrowing time for Dwarka residents as the South Corporation has been skipping garbage disposal daily across most residential societies. Delhiites are in for another rough winter when it comes to air pollution, said experts as the air quality in the Capital started dipping this past week. Alleging that over 1.86 lakh trees would be destroyed in the demolition of seven government residential colonies in New Delhi, the National Green Tribunal has sought the views of the centre on the issue, asking why it should not stop the redevelopment plan. The Centre’s ambitious plans to do away with landfill sites in 20 major cities, including Delhi, is being viewed with cautious optimism. ‘Beta, business karke kya karogi? Ghar ka kaam seekho’ — entrepreneurship is commonly seen as more of a man’s thing than it is seen as a woman’s. In an attempt to dispel the stereotype around female entrepreneurs, the students of Lady Shri Ram for Women have started a project Basta: Waste to Worth. Air pollution levels in Delhi on Tuesday and Wednesday — on Dussehra and a day after — was lower compared to the last two years, Delhi government data showed. The chairperson bench of the National Green Tribunal has put brakes on the implementation of the Delhi Development Authority’s ‘Unified Building Bye-Laws’ that sought to merge green clearances for constructions in 20,000 sq.m to 1,50,000 sq.m with building approvals. With the festival of Diwali, accompanied by air pollution, around the corner, the Delhi government has directed the Customs Department to prohibit the import of harmful crackers and asked the Delhi Police to ensure action is taken against any violation of law. With numerous initiatives to make the capital greener, the Delhi government has already crossed another target — planting 5 lakh shrubs this year to combat air pollution naturally. After delay of four years, the Ghazipur Waste to Energy (WtE) plant will be commissioned this month. While the district administrations and civic agencies were quick to remove the remains of Durga idols that were immersed in the Yamuna river on Tuesday, insoluble materials like wood, plastics, cloths and bamboo frame were found strewn along the river bank till late Wednesday evening. The Centre today launched a campaign to promote waste management in rural areas in a bid to promote sanitation and break caste nexus attached with cleanliness workers. There has been a 50% rise in air pollution in Gurgaon in the last 10 days as compared to last month. Despite a National Green Tribunal order banning burning of any type of waste in the open in the NCR, waste in being openly dumped and burnt in the Millennium City. Countries came to an agreement in Kigali on Saturday to phase out a family of potent greenhouse gases by the late 2040s and move to prevent a potential 0.5 degree Celsius rise in global temperature by the end of the century.